Here you will find our full catalog of products for 2018. The first half of this catalog contains the new release for Fall/ Winter 2018 and the second half containts the go-forward collections from January. 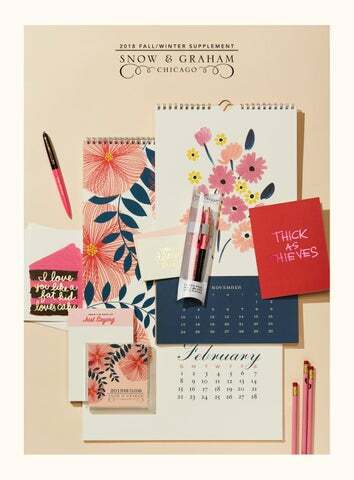 Our 2019 Calendar Collection gets us rolling right into complementary additions to the Everyday Collection. We have added two new categories that show off our cheeky side; Gilded Gift Enclosures and a new MINI notepad format. And of course we have our complete 2018 Holiday Collection. Continue on after holiday to view the full offerings for our remaining everyday product lines. First time orders require advanced payment by credit card and must meet a $250 minimum for domestic and $500 for international. A credit check is required to establish Net 30 terms on future orders. We accept payment by check, wire transfer, American Express, Visa or Mastercard. All orders ship FOB New Hampshire within 3 to 5 business days. If your order is required at once, please call to confirm availability and timing.